Before you read another word, please click on this photo so that it will fill your entire screen. 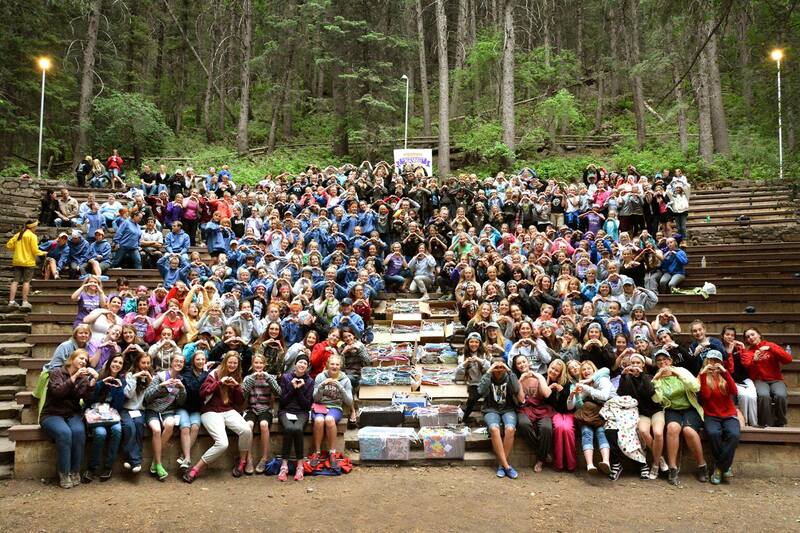 Look at the beautiful faces of all of these young women from Cedar Hills, Utah. Look at the hundreds of kits they assembled. Look at the joy and love in their faces and in their hands as they make hearts with their fingers to show the love they feel for sisters they will never know in this earth life. On Monday, many of the kits you see here will be loaded on a container going to Zimbabwe. Some will be held back for Mali. A few may even go to other places. Every one will go to places they are desperately needed. These tubs filled with goodness will be the answer to the prayers of girls who want to go to school and be educated and be safe from abuse and humiliation. There is a movement in our mountain valleys. We are changing lives. Every day there are miracles. Every day more join our numbers, helping with donations of time, money, sewing, cutting, tracing, ironing, and assembling feminine hygiene kits. Sometimes I lie awake in bed at night and remember the first time I learned about Days for Girls. I wrote about it in a post on March 8th 2013: http://annlaemmlenlewis.com/2013/03/08/days-for-girls/ Little did I know then how this project would change my life and the lives of 1000s of others. What I saw that night left me speechless. I have lived in Africa 4 years. In all that time, I never once had a conversation with another woman about feminine hygiene. The day after I learned about DfG, I came home and sent an email to all my quilt friends, book club, and email friends. I was so taken with this that I offered to speak to any group and offered to donate $50 for fabric for any group who would have an event and get involved. Over the summer, I started helping my friends get involved. A year ago, my own neighborhood got involved. In November my friends and I created a Utah Valley Days for Girls Chapter and I took our first kits to Mali. Since last November we have made more than 6000 kits. They have gone to more than a dozen countries. Girls lives are different because of what is happening here. The thing I wonder as I lie awake in bed at night is WHAT IF I HAD DONE NOTHING?? What if I had come home from that event, and checked another speaking assignment off my list of things to do? What if I hadn’t mentioned it to my friends? What if I let someone else worry about it? What if the drop in the bucket seemed just too overwhelming? WHAT IF I HAD DONE NOTHING?? I can hardly bear the thought of it. Today I looked at this photo of Cedar Hills girls that was just posted on Facebook and I cried at the thought of it all. I am one little tiny person in the grand scheme of things. But I can make a difference. We each can. Please join me. Or do nothing. It’s up to you. Pictured below: Lorri Cummings and Melissa Clark two of the first friends I invited to join me in this adventure and the 500 kits going to Zimbabwe on Monday. We may send even more if there’s room. Update: We are sending 1000 kits!! Update: We sent 2010 kits! Image | This entry was posted in Days for Girls, Humanitarian Work. Bookmark the permalink.